Hello furriends from Teko the ennui kitty. It was a rainy Thursday here in Tokyo today. 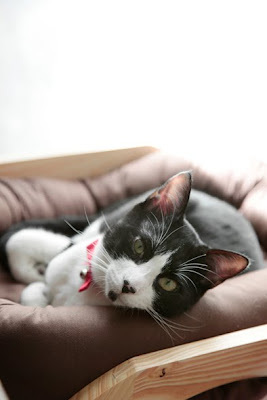 but these days we think maybe you have a chance to be a beautiful cat"
Isn't it too rude to me? I'm a natural born beauty. This is not a time to be unnui! 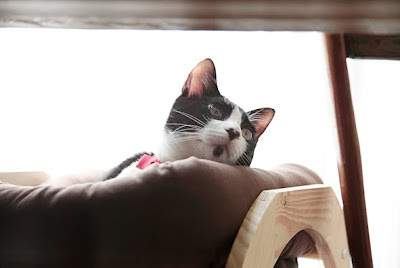 I introduced a very beautiful kitty,Suzuki in my Japanese blog. He's looking for a forever family in the Happy room #703. We live too far from most of you. So I was wondering if I should update this post or not. But mommy draw an illustration to help him find the family. I will introduce them anyway. Hope he will find a happy home soon. This is my beautiful brother,Ku-suke! I think there is NO CAT who is not beautiful. Thank you for visiting,reading and leaving comments on our blog. Our mommy needs a dictionary to read your blogs and sometimes she can't catch up with you very well but she's enjoying it! 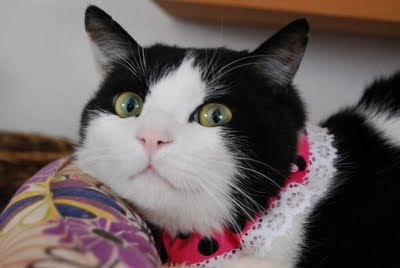 She really thanks your kindness to be patient enough with our blog with weird English! We want to thank you for the purrs and prayers for our G-Ma. We are hoping that she will be ok now for a long time to come. Hello Tekorin, it's lovely to meet you and your family. 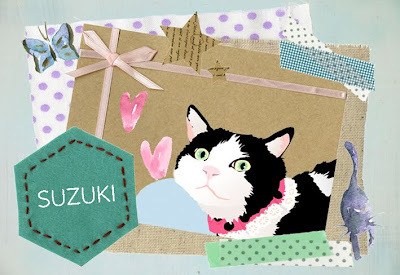 Suzuki is very handsome and we hope he finds a home soon, those graphics your Mom did are beautiful. We think your english is excellent, it's much better than our Japanese! You are both SUPER handsome and we are purrying that Suzuki finds a happy furrever home furry soon! We will purray for him that he does! Oh wow! Your mommy did an awesome job on that drawing! WOW!!! Please tell your Mommy that she is doing great with our language! Your pics are beautiful, but they always are so pretty! Hi Tekorin! We saw you requested to join the Naughty Kitty Club and wanted to come meet you! We wouldn't have ever known your mom didn't speak English - she is doing a great job! And wow, that is a wonderful drawing she did! We know you are far but we like to know about kitties who need homes, so we can send some purrs out into the universe to help them find their forever homes! We hope that Suzuki finds one soon! 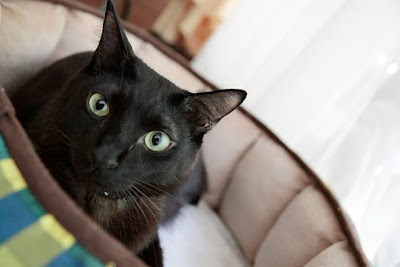 And you are a very beautiful cat - we agree with you that we think all cats are very beautiful! Please come by to meet us if you would like to - we would love to have you visit! Oh Teko! 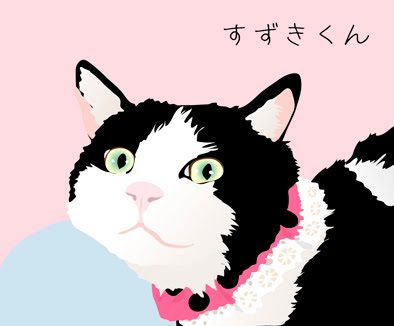 Your mummy is a very talented artist - what a great drawing of Suzuki! Please keep us posted on his well-being. Me and Charlie hope that he finds a forever home as he really is very pretty! 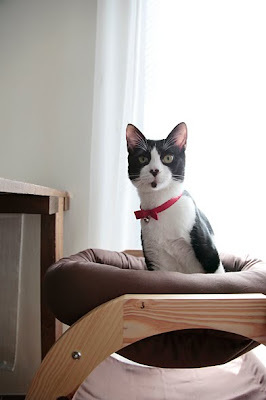 And Teko - you are also a very handsome and beautiful cat just like your sweet siblings Ku-suke and B-Sensei! Charlie says it's great being an ennui kitty! Tekorin, we think you have a very nice looking face!!!!!!! TenTen, we think you are already beautiful! And we agree that you, Ku-suke, Beat-Sensei, Suzuki and ALL kitties are beautiful. :) We are praying that Suzuki finds his forever home soon. I send you my love & hugs !!! My mommy loves her drawing its beautiful !! Thank you effurybody for your lovely comment!! Our mommy is happy that you liked her illustration. And thank you so much for your kindness to forgive our poor English! Sometimes it takes too looooong to blog in English so we might be a bit late to catch up with you and miss important posts. But we are enjoying a lot with our mommy to learn more about kitty English!! You are handsome inside and out!!! That is what makes you so special. Your Mom is a very talented artist. What a lovely drawing. We hope you have a great weekend. We will be celebrating my husband's birthday, which is April 27th,this weekend. We have some outside activities planned....but there is rain in the forecast we we'll see. What a beautiful illustration! Your mommy is very talented. We hopes Suzuki gets a forever-home real soon.